Open the Borders – Solidarity with all refugees! Last year’s “HoGeSa“ („Hooligans against Salafists”) march marked the start of a new wave of racist mobilizing and violence. There have been attacks on asylum seeker’s homes nearly every day between January and June 2015. Racist agitation against refugees found a sad climax in Heidenau, Saxony, where citizens and Nazis targeted a refugee center together and haunted the city in a mob action. While Nazis and right wing politicians try to spread racist resentments in Germany with their hate, Europe is experiencing a historical moment: Fighting for their freedom of movement, people have torn down the borders of fortress Europe and overcome its doctrine of wired fences and the Dublin agreement. Yet while this successful fight for freedom of movement opens up cracks in a regime of European containment, we shouldn’t forget the many deaths and injured – those who drowned in the Mediterranean Sea or suffocated on the trucks that transported them. “Fortress Europe” is accountable for thousands of deaths. Thousands of people who could successfully overcome these obstacles have arrived in Germany these past weeks. They weren’t welcome by German politicians, who are responsible for the political and economic situation of the countries people are fleeing from, but by many volunteers, who gave them a warm welcome and are supporting the struggle for their rights. At first, the German federal government succeeded in using the welcome movement to send an image of a “tolerant Germany” into the world. Meanwhile, in an effort to reinstall Europe’s deadly order, border controls have been reinforced and German as well as European borders are defended by the military. FRONTEX and the European Naval Forces (EUNAVFOR), along with the Geman military are being deployed against so-called human traffickers in the Mediterranean Sea, instead of rescuing drowning refugee boats. While refugees are being welcome at train stations, the German federal government is discussing how to restrict the right of asylum (which has already been tightened earlier this year) and make deportations easier. The separation between “good” (“political”) and “bad” (economic) refugees and the debate about the economic value of a migrant is a form of everyday racism of our state and society. While war is seen as a legitimate reason for asylum, poverty isn’t, even though the rich, capitalist states of the West have contributed to the harsh economic conditions in so-called “safe third-party countries”. The local governments in Germany now find themselves in a housing crisis, even though the arrival of great numbers of refugees was long foreseeable. They are in such need of even the essentials, that they rely on donations and the help of thousands of volunteers. This is a state that, without the bat of an eye, will rescue banks with billions of Euros, but views even a small percentage of these costs that are now needed as a financial burden. It’s not enough for us to block the „HoGeSa“ hooligans at their next march on October 25th. “HoGeSa“ is but one side of the racism that is present in all layers of society. Some of the nazis and hooligans are expected to arrive early and, like last year, attack people who don’t fit into their world view. That’s why, we, as antifacists, antiracists, refugee initiatives and the welcome movement will take to the streets on October 24th and speak out against racism in every form. Solidarity with refugees can’t be just welcoming acts. 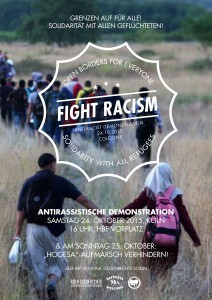 Solidarity also means offering protection from nazis on October 24th/25th in Cologne and elsewhere, and fighting against deportation and European border policies! Escape aid – not Frontex! Support the demands of refugees! 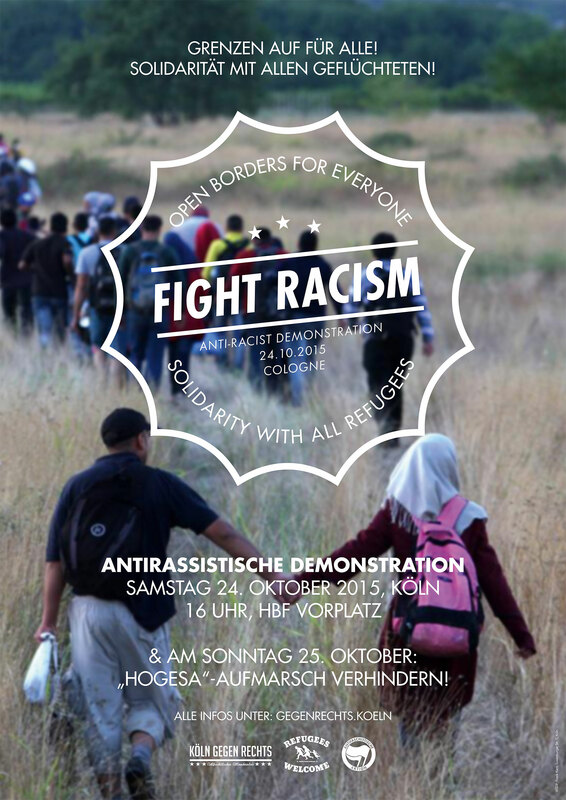 25.10.2015, Cologne: Block the “HoGeSa” march!